Rinse garbanzo beans in cold water and drain. Keep heat on medium and add chopped onions. Fry the onion and spice mixture for a few minutes, until the onions turn light brown (translucent). Add garlic and ginger paste, stir and cook for 1 minute, stirring frequently. Raise heat to medium-high, add chopped tomatoes, stir and cover pan. Cook for approx. 10 minutes, stirring occasionally, until tomatoes become soft and break down. The mixture should start to look like a chunky gravy at this point. If not, you may need to cook it for a little bit longer. Add the tomato paste to the mixture and stir. Take 4-5 tablespoons of your chickpeas and put them in a dish and mash them down a bit. Then add the mashed chickpeas and the balance of the whole chickpeas to the tomato mixture. (The mashed chickpeas will help to create a great gravy for your chickpea curry). Cover and cook on medium heat for 5 minutes, stirring occasionally. Add salt, red chilli powder, ground cumin and water. Keep heat on medium, stir, cover and cook for approximately 20 minutes, stirring occasionally, until chickpeas have reached your desired consistency. Add garam masala, stir and return to the heat for another minute or so. Check seasoning at this time and add more salt, red chilli powder or garam masala if desired, keeping in mind that the curry should be cooked for another minute after any additional seasonings have been added, to allow the flavours to combine. When it’s time to eat, serve the chickpea curry garnished with a sprinkling of chopped cilantro (if desired) either over basmati rice or serve with fresh naan bread or rotis. Like many indian dishes, this tastes EVEN BETTER the following day! For the lacto vegetarians out there, this dish tastes great with a side of cucumber raita (in a bowl, mix a cup of peeled, deseeded, finely chopped cucumber and a small deseeded chopped tomato with 2 cups of plain (unsweetened!) yogurt, 1/2 teaspoon of salt (to taste) and fresh ground pepper). A tasty way to spice up day-old rice…..
Heat oil in a large deep pot. Add cashews and fry for a few seconds until they start to brown slightly, remove from oil and put aside. In the same pot, add onions and garlic, sautéing on medium heat for 2 minutes. Add carrots, green peppers, red peppers, mushrooms and sauté for several minutes until vegetables are half cooked. Add Patak’s Biryani Curry Paste, tomatoes and coconut milk to vegetable mixture. Cook on medium heat, stirring often for 5 minutes. Add salt and red chilli powder to taste. Add fried cashews into vegetable mixture. Add rice to vegetable mixture slowly, incorporating one cup of rice at a time until all rice has been mixed in evenly. Cover and heat on medium until rice is heated thoroughly. Sprinkle with chopped fresh coriander if desired. Serve with yogurt raita and pappadums as accompaniments. Enjoy! 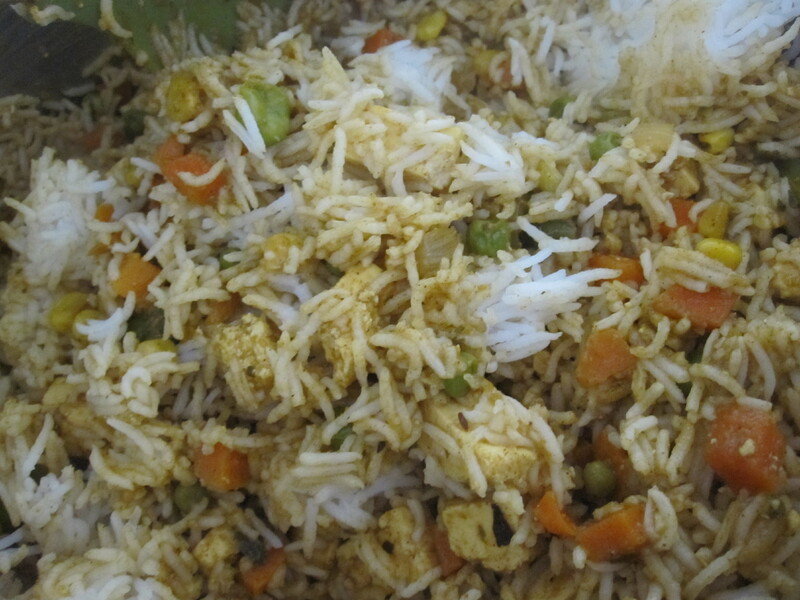 Tip: This biryani is even more flavourful the following day! Have you made this dish? Let me know what you think!